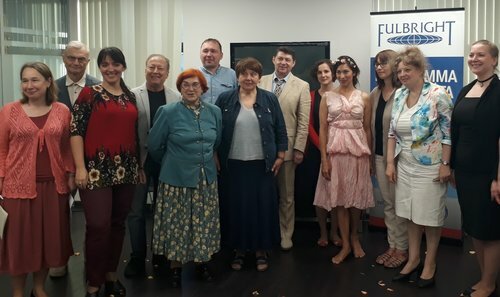 The Fulbright Program in Russia | Alumni Salon "Isadora Duncan's Creative Heritage"
On May 29, 2018, the Fulbright office in Moscow hosted another evening salon for Fulbright alumni. This time the topic of discussion was Isadora Duncan's creative heritage. The salon was hosted by Elena Yushkova, Fulbright-Kennan Program alum of 2007-2008, and featured a performance and talk with a Duncan dancer from the U.S. Vidala Neyanaya. Elena is Candidate of Art and author of the book "Plasticity of Overcoming". She started the event by telling guests about her long-term study of the creative heritage of the American dancer Isadora Duncan, who was closely connected with Russia and the USSR: in the 1900s, the Silver Age poets warmly welcomed her, and in the 1920s she created a dance school in Moscow. Elena’s research and input somewhat contributed to Duncan dancers from all over the world coming together and that ultimately led to the creation of international symposia about Duncan, which Elena attended in 2013 and 2017. Elena had already organized a tour in Vologda for a dancer of the Duncan technique – it was Meg Brooker in 2013. This time, supported by the Education & Culture Department of the U.S. Embassy in Russia, Elena arranged the visit of another American Duncan dancer – Vidala Neyanaya, who came to Russia for the first time. The guests of the salon represented a variety of fields, from Musicology and Philosophy to Political Science and Medicine, but it was safe to say that all of them were eager to know: what kind of "dance technique" Isadora Duncan introduced a 100 years ago and how it differed from other dance traditions? Vidala’s brief but memorable performance after Elena’s introduction was the answer everyone was looking for. Vidala is known as the only student and protégé of Lily Dikovskaya, the student of Isadora and her daughter Irma who lived in Moscow until 1946 when she immigrated to London. Lily never recruited students except for Vidala, in whom she found the true potential for the dance that Isadora had envisioned. Wearing a dress sewn by her mentor, Vidala performed to several music pieces by Chopin. Her inspired performance caused a round of applause. Although not all the guests might have received a clear understanding of Duncan’s technique, however, it was safe to say that the dancer’s expressive and graceful movements easily conveyed the emotional richness and depth that the Duncan’s dance presupposes. 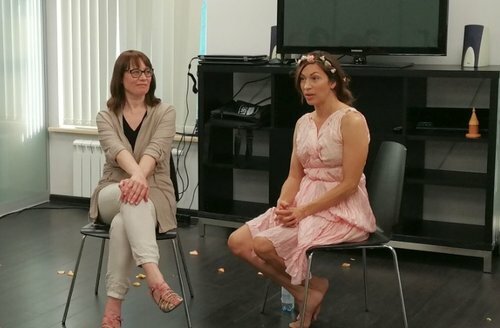 After the performance, a Q & A session with Vidala and Elena followed, revealing even more interesting facts about Isadora, her followers and the future of her dance both in Russia and in the world. Many guests were interested in Vidala’s ethnic roots (her mother comes from an ancient Native American tribe) and its impact on her chosen path of dance and mentorship. Vidala is trained in healing dance of Native American shamans, which she demonstrated in the following days at the reception in the American Center of the U.S. Embassy in Moscow. According to Vidala, Duncan’s dance stems significantly from the actual experience of the dancer – pain, sadness, loss, love, disappointment, inspiration - all those are somewhat indispensable in order for the dance and emotion displayed by it to be sincere and heartfelt. Vidala also spoke of her non-profit in New York, particularly her dance therapy lessons for abused children and teenagers from disadvantaged families. In her words, it is amazing how dance therapy helps children to "tell" their difficult stories through movement rather than words, gradually providing for recovery from suffered trauma. Like always, the guests of the evening were Fulbright alumni: professors, lecturers and researchers of various Moscow universities and institutes, including Moscow State University, Moscow Tchaikovsky Conservatory, Institute of Russian History of RAS, Sechenov First Moscow State Medical University, and Russian State University for the Humanities. Meeting and talking with Elena and Vidala undoubtedly expanded the guests’ impressions on the essence, message and heritage of Isadora Duncan’s dance tradition, as well as allowed the Fulbright alumni once again to become a bit more acquainted with the scope of each other’s research and endeavours.